I came across the bio of Mary Read on Wiki, and am left a little awestruck. If you'd like a swift injection of Carpe Diem, read on. Mary Read was illegitimately born in England, in the late 17th century, to the widow of a sea captain. Her birth was sometime between 1670-1698. Read's mother began to disguise illegitimately-born Mary as a boy after the death of Mary's older, legitimate brother. This was done in order to continue to receive financial support from his paternal grandmother. The grandmother was apparently fooled, and Read and her mother lived on the inheritance into her teenage years. Still dressed as a boy, Read then found work as a footboy, and later found employment on a ship. She later joined the British military, allied with Dutch forces against the French (this could have been during the Nine Years War or during the War of the Spanish Succession). Read, in male disguise, proved herself through battle, but she fell in love with a Flemish soldier. When they married, she used their military commission and gifts from intrigued brethren in arms as a funding source to acquire an inn named "The Three Horseshoes" near Breda Castle in The Netherlands. Upon her husband's early death, Read resumed male dress and military service in Holland. With peace, there was no room for advancement, so she quit and boarded a ship bound for the West Indies. Read's ship was taken by pirates, who forced her to join them. She took the King's pardon c.1718-1719, and took a commission to privateer, until that ended with her joining the crew in mutiny. 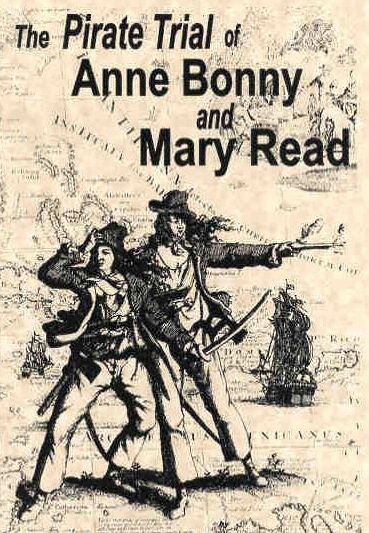 In 1720 she joined pirate John "Calico Jack" Rackham and his companion, the female pirate Anne Bonny. Read remained dressed as a man at first. Nobody knew that Read was female until Bonny began to take a liking to Read thinking she was a handsome young fellow. That forced Read to reveal to Bonny that she was a woman. Rackham, who was Bonny's lover, became jealous of the intimacy between them and threatened to cut the throat of Bonny's new paramour. To prevent Read's death, Rackham was also let in on the secret; following, Rackham decided to break male seafaring tradition by allowing both women to remain on the crew. During their brief cruise in late 1720, they took several prisoners to force them into useful service. Read fell in love with one such victim who was surprised to learn she was a woman and eventually returned the affection. When one of the pirates challenged her lover to a duel, Read contrived a secret duel to occur a couple hours earlier. She killed the pirate before he could bring any harm to her lover, whom she called "husband" as they made vows to each other in absence of a minister. Eventually, Read and Bonny would wear men's clothes while attacking merchants in Jamaica, and women's clothes at other times. In October 1720, pirate hunter Captain Jonathan Barnet took Rackham's crew by surprise while they were hosting a rum party with another crew of Englishmen off the west coast of Jamaica. After a volley of fire left the pirate vessel disabled, Rackham's crew and their "guests" fled to the hold, leaving only the women and one other to fight Barnet's boarding party. Allegedly, Read angrily shot into the hold, killing one, wounding others when the men would not come up and fight with them. Barnet's crew eventually overcame the women. Rackham surrendered, requesting "quarter." Rackham and his crew were arrested and brought to trial in what is now known as Spanish Town, Jamaica, where they were sentenced to hang for acts of piracy, as were Read and Bonny. However, the women escaped the noose when they revealed they were both "quick with child" (known as "Pleading the belly"), so they received a temporary stay of execution. Read died in prison in April 1721, but there is no record of burial of her baby. Official documents state that Read died of fever associated with childbirth. Bonny disappeared from the historical record, presumed to have lived a long life in Colonial America. A trip to the beach, a pirates tale... Sometimes, you need to take a break to remember the whys. That said, time to go brave the heat and epoxy something. I love reading all of your posts, Sarah. This was particularly inspiring! "History is a damn good story; all it needs is a damn good telling." -Des Brogan (my boss). I'm sure I'll think of Mary Read and her colourful life often! Wonderful tale of her-o-ism. Thank's daughter mine for sharing that wonderful pirate tale.